With the summer jazz festival season drawing to a close, so begins the start of a new season - the season of musicians applying to play at next year's summer jazz festivals. With only a few weeks since this year's festival ended (which was their 20th year no less), Manchester Jazz Festival have opened submissions for their 2016 festival. The online application form is very clear and easy to use and they'll be accepting submissions until 5pm on December 11th 2015. Successful artists will be contacted by around 5th February 2016. As well as submissions for the regular festival programme, there is also an opportunity for young musicians to apply to their MJF Introduces scheme and for composers to apply to the Irwin Mitchell MJF Originals Commission scheme. 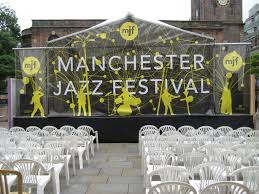 All information can be found on the Manchester Jazz Festival website. Good luck!